A Linux After Dinner "Mint"
A couple of weeks ago I had a chance to visit the local Micro Center in Cambridge, and while I was there I was able to pick up one of the latest issues of Linux Format magazine. Issue #162 of Linux Format was their annual "Distribution Grudge Match" issue where they tossed a dozen or so Linux distro's into one of the WWF's "cage match" wrestling cages, sat back, popped a cold brew, and watched the fireworks! When the dust cleared, (and the bodies were removed), the distribution left standing at the end of it all was Linux Mint. This was a bit of a shock to me since Mint went head-to-head with some of the heaviest of the heavyweight distributions; defeating distro's like Ubuntu and Fedora who normally send opponents scrambling for cover. Mint went head-to-head with the best distributions out there, they were all compared based on a whole host of differing criteria, and at the end of it all Mint had really made a name for itself. As to the "why" of it's victory, I can't do much better than refer you to the statement made by the folks at Linux Format, when they said, (something like), "Linux Mint isn't about new or flashy features, it's about stability and usability." They went on to say that Linux Mint would often avoid the whizz-bang features of other distributions, concentrating on what they know works and works well. What really differentiates Mint is the fact that they base their distributions on Ubuntu's "LTS" (Long Term Support), releases instead of whatever flashy new release was just tossed at an unsuspecting public. Even with that, they carefully pick-and-choose what pieces of the latest LTS release they want to include, skipping anything that they don't believe offers real value to their users. 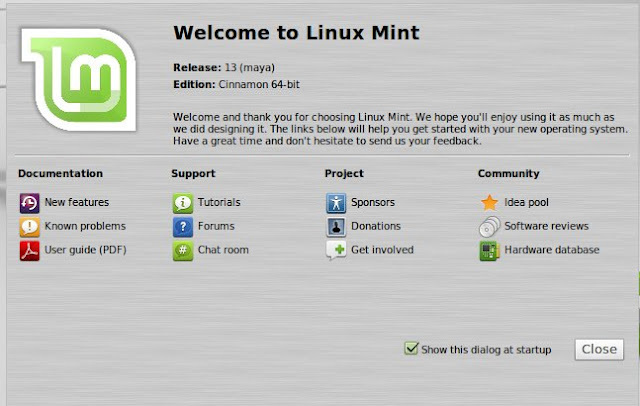 Another differentiating feature of Mint is their new desktop manager, Cinnamon. They saw that many Ubuntu users, (including Yours Truly! ), were getting heartily tired of the Gnome vs KDE desktop wars, their dissatisfaction with the bizarre desktop that Ubuntu calls "Unity," and Canonical's seeming deaf ear to user suggestions or complaints. Seeing their disgust, the folks at Mint developed an in-house desktop called Cinnamon. Cinnamon is a light-weight desktop following the basic Mint premise of eschewing flash and glamor in favor of a stable, working, desktop manager that does everything you need, and nothing you don't. The distinguishing feature of Mint's implementation of Cinnamon is the absence of "features." They don't throw IM clients, e-mail clients, and other assorted horse-hooey at you. They don't clutter your desktop with various kinds of "super-bars", or other unessential cruft and bloat. It's remarkable in its muted color-scheme as opposed to the garish colors of Ubuntu's Unity desktop. In fact, the "it just works" design philosophy of the Cinnamon desktop has become so popular that other Linux distributions have begun using, or offering, the Cinnamon desktop with their own releases. notable for it's clean, open appearance and muted color scheme. Aside from the lack of clutter on the desktop, (the only two icons that appear by default are the "Computer" and "Home" folders), the task bar / system tray at the bottom is the only real tool-bar on Mint's Cinnamon desktop. This provides a big working surface that is easily configured to your own personal tastes. to give you a quick "heads up" on the status of your system. My only real beef with Mint's task bar is that it's a bit too thin for my taste. Since I have just started messing with this myself, I may well find a setting that allows me to change it's size. showing the "Welcome" window and selections. Normally, I really hate having a pop-up screen shoved into my face, be it at first boot or otherwise. 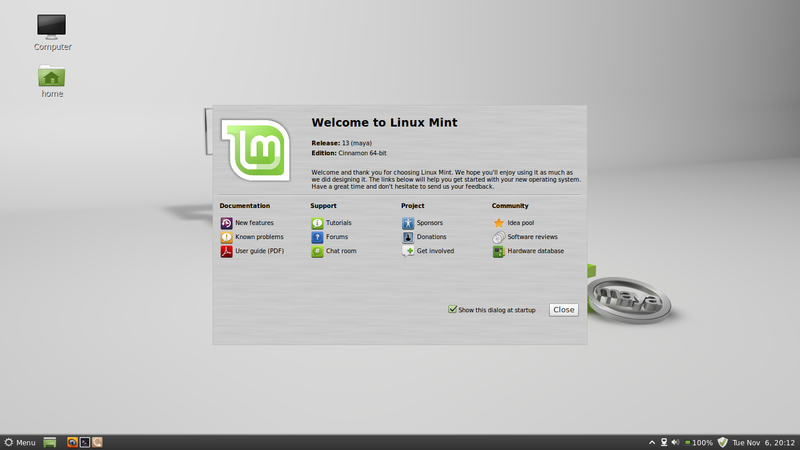 Strangely enough, Mint's initial dialog isn't really "in-your-face" as it blends in nicely to the rest of the desktop. Its message is polite and respectful, and the various options offered are actually useful. Though you have the option to avoid seeing this dialog at start-up, I have found it sufficiently useful that, at least for now, I keep it there for my own reference. showing a number of useful and interesting links. I really like both the design and layout of Mint's default Cinnamon desktop. Most other desktops, (at least in my opinion), look like something designed for hawk-eyed 20 year old eyes. Either the color choices are too bizarre, or the control elements are way too small for my own eyesight. Likewise, Cinnamon's organization of both the desktop and the various window controls is strikingly similar to the Windows desktop, which makes the transition from one to the other a much less painful process. 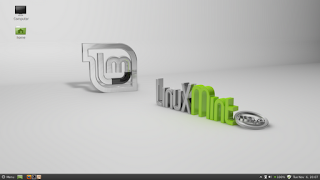 Mint is one of the easier distributions to install and use. This makes sense as it is one of the many Ubuntu re-spins out there and the whole Ubuntu heritage was built on usability. Linux Mint, in the true spirit of Ubuntu's tradition of offering choices, creates several different spins of each distribution, with the Gnome, KDE, or Cinnamon desktops preinstalled. You want Gnome? No prob! You download the "Gnome" version and away you go. Likewise with KDE or Cinnamon. Mint 13 includes the usual plethora of applications and other "stuff" that seems to be expected in a desktop system, including things like the Gimp image editor, and Libre Office. Additionally, their standard distribution comes with all the codecs and viewers that you normally have to go hunting for, and it also includes, pre-installed, Adobe Reader and Flash. The result of all this effort is a distribution that is ready for prime-time, right out of the box. Of course, if you are a distribution purist, they also create distribution spins without all the limited rights stuff installed. It's your choice. In the same vein, unlike Ubuntu and other clones, all of the useful repositories are pre-selected by default. This means that you don't have to re-configure the update manager to include the repositories you need. The other side of all that effort in your behalf is that after you finish the installation, you should go check for updates. When I checked for updates after my own install, there were something like 450 updates listed. However the total size for all the updates was less than 500 megs, and they were all done - soup to nuts - in less than a half-hour. Oh, and while we're on the subject of updates and download speeds. . . . . .
One of the nicest touches I found was an option within the update manager's configuration settings that would test each of the Linux Mint mirror sites, and then offer you the best and fastest mirror site based on where you are. 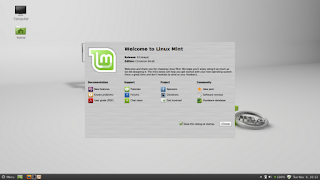 The bottom line is that Linux Mint 13 is an eminently usable distribution. If you are used to the way other distributions organize things, there might be just a bit of a learning curve here. However I don't think this will be much of a problem since things are conveniently placed where you would reasonably expect to find them. Likewise the open and uncluttered desktop allows you to organize your workspace in whatever way you are most comfortable with.